The paper involved a monumental data collection effort to address an important societal question. The analyses are rigorous, clever and transparently reported. Nevertheless, I do not believe the above conclusions are justified from the evidence. Relying on additional results reported in the paper, I show here the data are consistent with police shootings being biased against Blacks, but too noisy to confidently conclude either way ,. As others have noted , an interesting empirical challenge for interpreting the shares of Whites vs Blacks shot by police while being arrested is that biased officers, those overestimating the threat posted by a Black civilian, will arrest less dangerous Blacks on average. They will arrest those posing a real threat, but also some not posing a real threat, resulting in lower average threat among those arrested by biased officers . For example, a biased officer may be more likely to perceive a Black teenager in a bikini as a physical threat (YouTube) than a non-biased officer would, lowering the average threat of his arrestees. If teenagers in bikinis, in turn, are less likely to be shot by police than armed criminals are, racial bias will cause a smaller share of Black arrestees to be shot. A spurious association showing no bias precisely because there is bias. 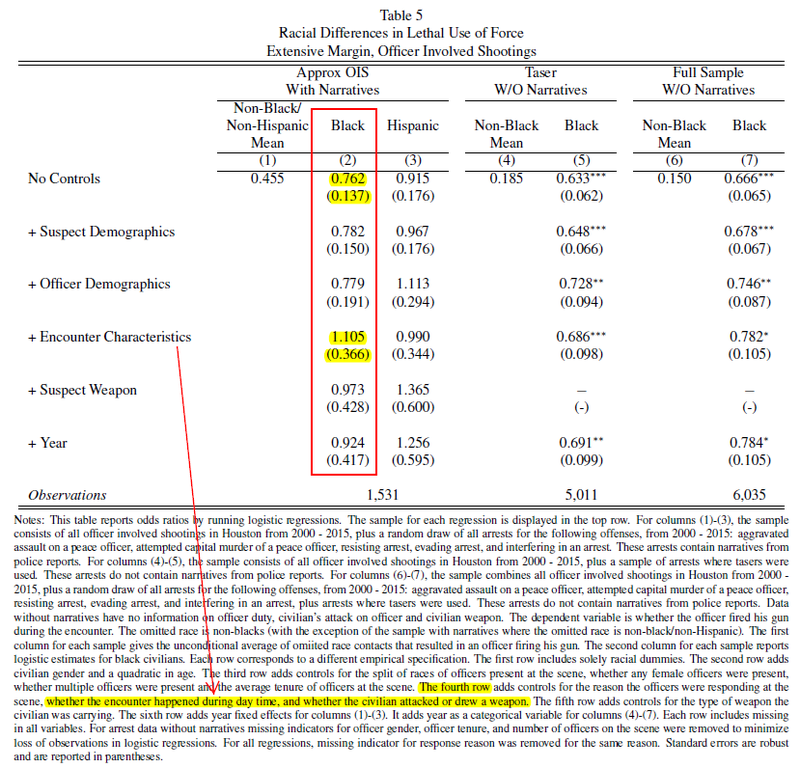 A closer look at the table behind the result that Blacks are 23.8% less likely to be shot, leads me to suspect the finding is indeed spurious. Let’s focus on the red rectangle (the other columns don’t control for threat posed by arrestee). It reports odds ratios for Black relative to White arrestees being shot, controlling for more and more variables. The numbers tell us how many Blacks are shot for every White that is. The first number, .762 is where the result that Blacks are 23.8% less likely to be shot comes from (1-.762=.238). It controls for nothing, criminals and teenagers in bikinis are placed in the same pool . The highlighted Row 4 shows what happens when we control for, among other things, how much of a threat the arrestee posed (namely, whether s/he drew a weapon). The odds ratio jumps from .76 to 1.1. The evidence suggesting discrimination in favor of Blacks disappears, exactly what you expect if the result is driven by selection bias (by metaphorical teenagers in bikinis lowering the average threat of arrestees). Given how noisy the results are, big standard errors (see next point), I don’t read much from the fact that the estimate goes over 1.0 (showing discrimination against Blacks), I do make much of the fact that the estimate is so unstable, and it moves dramatically in the predicted direction by the “it is driven by selection-bias” explanation. Row 4 is compatible with Blacks being 80% more likely to be shot than Whites. These results do not justify updating our beliefs on the matter one way or the other. How threatening was the person shot at? When a police officer interacts with a civilian, is a Black civilian more likely to be shot than a White civilian is, for a given level of actual threat to the police officer and the public? The better we can measure and take into account threat, the better we can answer that research question. The NBER paper includes analyses that answer this question better than the analyses covered by The New York Times do. For instance, Table 8 (.png) focuses on civilians shot by police and asks: Did they have a weapon? If there is bias against Blacks, we expect fewer of them to have had a weapon when shot, and that’s what the table reports . 14.9% of White civilians shot by White officers did not have a weapon. 19.0% of Black civilians shot by White officers did not have a weapon. The observed difference is 4.1 percentage points, or about 1/3 the baseline (a larger effect size than the 23.8% behind the NY Times story). As before the estimates are noisy and not statistically significant. When big effect size estimates are not statistically significant we don’t learn the effect is zero, we learn the sample is too small,the results inconclusive; not newsworthy. One solution is larger samples. Obviously, but sometimes hard to achieve. Collecting additional proxies for threat could help too. For example, the arrestee’s criminal record, the reason for the arrest, and the origin of the officer-civilian interaction (e.g., routine traffic stop vs responding to 911 call). What kind of weapon did the civilian have and was it within easy reach. Etc. The data used for the NBER article includes long narrative accounts written by the police about the interactions. These could be stripped of race identifying information and raters be asked to subjectively evaluate the threat level right before the shooting takes place. Finally, I’d argue we expect not just a main effect of threat, one to be controlled with a covariate, but an interaction. In high-threat situations the use of force may be unambiguously appropriate. Racial bias may be play a larger role in lower-threat situations. PS: Josh Miller (.htm) from Bocconi had a similar set of reactions that are discussed in today’s blogpost by Andrew Gelman (.htm).